Reinhardt University is gearing up for the inauguration of its 20th President, Dr. Kina S. Mallard. The almost two-week-long celebration will be held April 4-17. 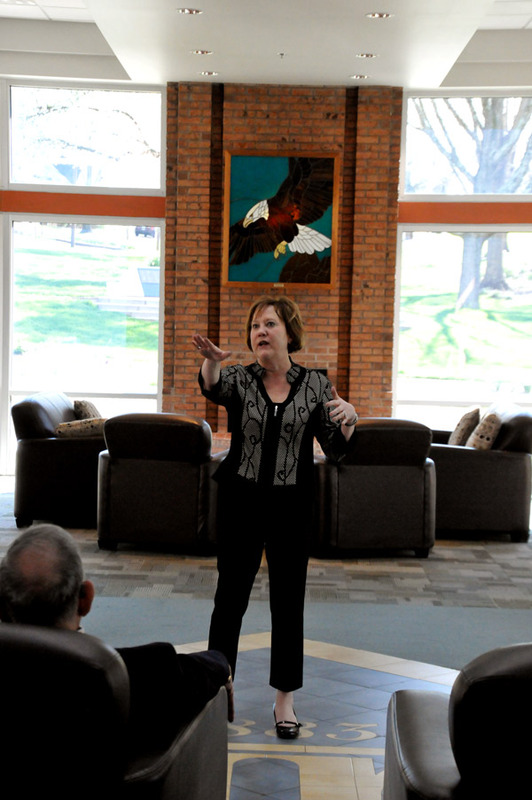 Dr. Kina Mallard speaks during an a pre-inauguration event held by members of the Campus Catholics Ministry March 23 at the Bannister Glasshouse. Special guest included Rev. Victor Reyes of Our Lady of La Salette Catholic Church in Waleska. The event will kick off with an art gallery reception Monday, April 4 at the Falany Performing Arts Center. The opening reception will begin at 6 p.m. Light snacks will be served, and the event is open to the public. The exhibit will continue daily from 10 a.m. to 8 p.m. through May 6. The art on display is in honor of Dr. Mallard, and each piece will have a connection to Reinhardt’s newest president. The guest artists include Ann Bailey, of Canton; Nancy Currie Moore, of Canton; Lisa Flanary, of Jefferson City, Tennessee; Angela D. Lee, of Nashville, Tennessee; Michael Mallard, of Plains; Melissa Mann Bean, of Louisville, Kentucky; Julie Rabun, of Jefferson City, Tennessee; David Underwood, of Jefferson City, Tennessee; Joshua Wagner, of Nashville, Tennessee; and Jen White, of Memphis, Tennessee. The Reinhardt University Choir Concert at the Falany Performing Arts Center Sunday, April 17 at 3 p.m. See Reinhardt.edu for ticket information.